A good old-fashioned bar of soap that's 100% organic and fair-trade, and safe for those with allergies and sensitive skin. I chose that header in honour of my Star Wars geek boyfriend, so I hope he appreciates it. Anyway back to the topic! When I went to Tullivers in York last Christmas I picked up a bar of Dr Bronner's Baby Mild Soap, mostly out of intrigue. It wasn't very expensive, maybe £3. It's strange that after steering away from it my whole life, the best washing products I've used for my eczema have been actual bars of soap rather than some kind of moisturising body wash. Dr Bronner's soaps are Fair Trade, organic and made with 100% natural ingredients. The main ingredient of the Baby Mild soap is coconut oil, which as you know, I love! And the other ingredients are pretty much nothing but other natural oils, namely palm oil, olive oil, hemp oil and jojoba oil. What's the Dr Bronner soap like? The baby mild soap is a pure white bar, without any sort of strong smell. It lathers like a normal soap and is great to wash with - not too drying, although you will of course need to moisturise a lot after your shower if you have eczema or dry skin. I found that it did not irritate my skin at all, probably because it has absoltely no nasties in it at all. Who is this Dr Bronner? 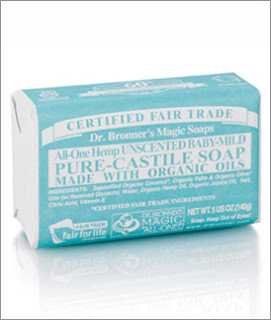 Whatever you make of Dr Bronner the man (I think he seemed like a total dude!) I recommend his baby mild soap if you have eczema or dry skin - or babies to wash! Dr. Bronner’s Baby Mild soap bar is definitely a superb product. Its quality which attracted me the most is that it is unscented and perfectly suitable for children too.